This weekend represented the end of one chapter of my life and beginning of the next. 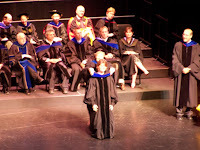 Though I officially graduated with my Ph.D. in December, this weekend was my ceremonial hooding. I was pleased to have my advisor "hood" me on Saturday. 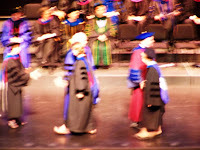 The academic regalia, including the "hoods" that professors wear during commencement is a tradition that dates back to medieval times. Yesterday I turned in all of my grades (all 1000+ of them) for my two classes. I still have a few loss ends, but for the most part, I am done with teaching for the semester. Now on to the new chapters. This summer I will be working as a botanist at the Kansas Biological Survey. In fact, I should be packing right now for a trip to Nebraska (we leave in an hour). I am very much looking forward to this change of pace. But the biggest change will come this August - we will be moving to Liberty MO as I have gotten what is just about my ideal job. I will be teaching ecology/botany/biology at a small liberal arts college in Liberty. I am so excited about this position, though at this time it is a visiting professor position for two years. Lots of changes in the air, and this is a good thing.